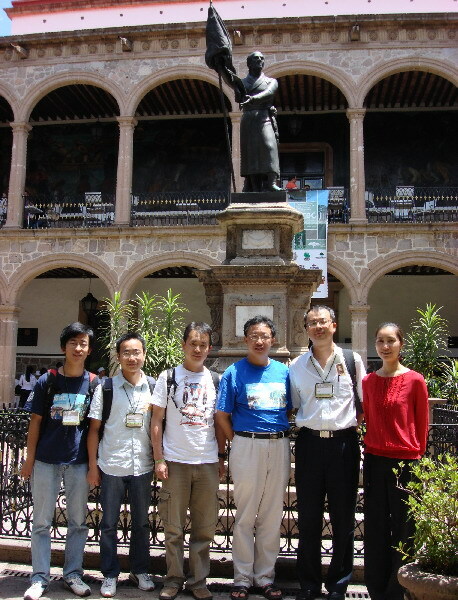 The annual meeting 2007 of the Association of Tropical Biology and Conservation (ATBC) was held in Morelia, Mexico during July15-19, with the theme “Linking tropical biology with human dimensions”. Prof. Dr. <?xml:namespace prefix = st1 ns = "urn:schemas-microsoft-com:office:smarttags" />Cao Min, Prof. Dr. Li Qingjun, Assoc. Prof. Sha Liqing, and Assoc. Prof. Zhang Ling of XTBG participated in the meeting. XTBG was the only Chinese institution of tropical biology which played a role at ATBC 2007. Among the 700 more representatives from 45 countries, 9 world-renown scholars were invited as keynote speakers. Prof. Cao Min and Prof Li Qingjun respectively made presentations at different symposia. Dr. W. John Kress of National Museum of Natural History and Dr. Li Qingjun co-organized the Symposium named “Diversity and Evolution of Pollination and Mating Systems of Tropical Plants”. Dr. Zhang Ling and other two XTBG doctoral students studying in America submitted posters. As a member of the ATBC, Prof. Cao Min attended the board meeting of the Association for Tropical biology and Conservation (ATBC). Being a subject editor of Biotropica, Prof. Li Qingjun took part in the work meeting of its Editorial Board. Two workshops (“Application of Stable Isotope in Tropical Biology Studies” and “Application of Acoustic Methods to Monitoring Behaviors of Bats”) were held after the conference. XTBG has ever hosted the annual meeting 2006 of ATBC in Kunming. Prof. Dr. Chen Jin was elected as the founding chairman of ATBC Asian Chapter in 2006. The inaugural meeting of ATBC Asian Chapter was held in India in March.